Nicole's Needlework: Cross Stitch Related Post! I remembered I got this in the mail the other day. It was on sale at Needlecraft Corner. 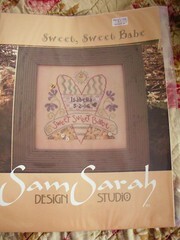 Sweet Sweet Babe by Sam Sarah. Some threads it called for and the buttons. Pretty design. I'm not typically a Sam Sarah fan but I do like this one. That is a sweet design. I am sure they will love it. I think that's a good idea not to tell anyone so they can't say they don't like the name. Good for them. Ann. That's a lovely baby sampler. 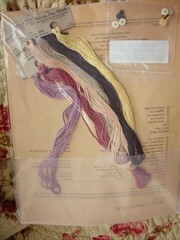 And it looks like it will be fun to stitch too. Can't wait to see your progress. What a nice gift; one to treasure. Has the stitching slump officially ended? Glad your slump seems to have ended. This is such a sweet design! Oh how very nice!! I love it! A bit of January - Finished! Sweet Sweet Babe - almost finished!